The Rugby Football League insists its Challenge Cup draw was correct, despite claims on social media that the numbers nine and six were mixed up. Salford were drawn to play Widnes, who were ball number nine, but social media observers suggested it was a reversed six - Bradford's number. 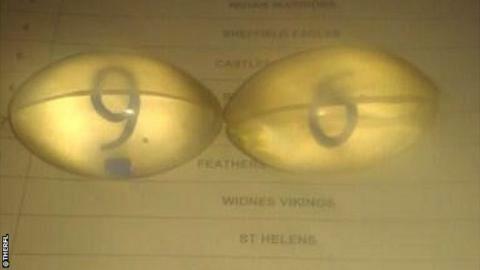 The RFL tweeted: "Happy to confirm that the draw was correct - ball No 6 does not have a line: only No 9 has a line." The fifth-round draw featured three all-Super League ties. It was conducted by Hall of Fame members Alex Murphy and Garry Schofield but, with social media comments continuing to claim a mistake had been made, the RFL sent another tweet. "Disappointing so many people are keen [to] believe two members of the RL Hall of Fame are complicit in lies, cover-ups and conspiracies," it wrote.